Have a copy if anyone is after one. With sleeve. Thanks . Pictures have orange labels, this cannot be 1965 but at least 1968 for original RCA Victor. I have a black label Germany that fits better to this year of release. 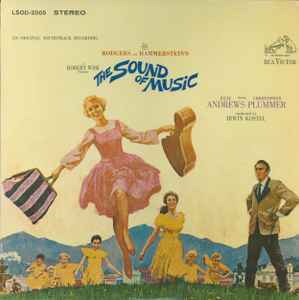 Amazing UK original pressing of this classic soundtrack of a favourite musical. There is some groove noise but mercifully it is at a lower level than the tape hiss so it's very presentable and listenable - probably the best version yet and much better compared to digital remasters. It is interesting to note that along with the usual botched titles typically found on First Records releases, this also includes the misprint (all spelled correctly!) on A5 (I Have Confidence In Me) that was on original US pressings label (and cover track list on mono versions). It was quickly corrected to "I Have Confidence". Trivia - Bill Lee is Christopher Plummer's uncredited singing voice, heard throughout the film and on this soundtrack. Included inside sleeve, 8 page color "Original Soundtrack Album And Storybook". Originally Produced on the Stage by Leland Hayward, Richard Halliday, Richard Rodgers and Oscar Hammerstein II. Suggested by "Maria Trapp's Story". I have the orginal record of this album, how much would it be worth, near mint condition?